It's an empty gesture from the Republican nominee, who opposes marriage equality and has a proudly homophobic running mate. A crowd of Colorado Republicans cheered as presidential candidate Donald Trump took the stage Sunday in Greeley — displaying a rainbow flag as he paced the stage. 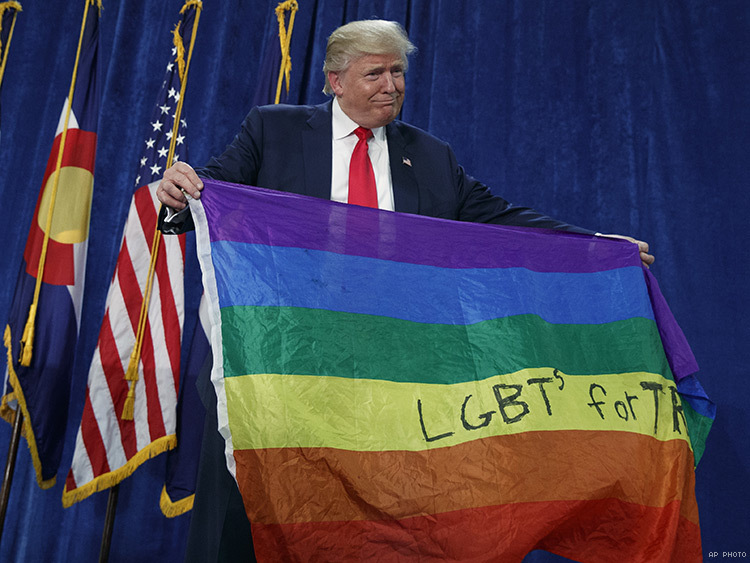 “LGBTs for Trump” was written in black marker on the flag as Trump, smiling, displayed the flag to cheers. While Trump opened with the flag, his speech retraced many of his popular talking points: repealing Obamacare, a corrupt election, and bashing opponent Hillary Clinton. Trump has made similar overtures to queer Americans since the Republican convention in July, when he mentioned them in his acceptance speech. He has courted the support of gay tech mogul Peter Thiel, and he has advocated for LGBT people when talking about his opposition to the Islamic State. However, LGBT advocates have spurned Trump, saying that his gestures amount to little more than pandering — he opposes marriage equality and has wavered on transgender rights and the Equality Act, which would ban anti-LGBT employment and housing discrimination. Besides, his running mate, Mike Pence, has a history of support for anti-LGBT measures, including a law during his time as Indiana’s governor that would allow businesses to deny services to LGBT people based on religious reasons. Additionally, a earlier poll shows that almost three-quarters of LGBT voters will choose Clinton in the election. Election Day is November 8.